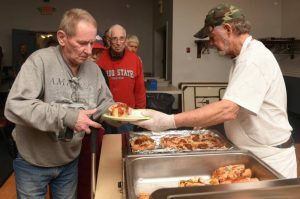 Eddie Hanlon, a volunteer with Building Bridges serves Dan Willard lunch at the World War II club for the Wednesday lunch. Rice, a practicing psychiatrist on Crafts Avenue, says he came to the luncheon one day in past months for a meal. Since then, the community he’s found has helped him to identify more as a veteran, and now he spends lunch hour every Wednesday at the club, Rice says. “It’s really extended family,” Caggiano said. South Deerfield Polish American Citizens Club, 46 South Main St. in South Deerfield on the last Tuesday of the month from noon to 1:30 p.m.
Elks Lodge, 2 Church St. in Greenfield, ​Thursdays from noon to 1:30 p.m.
Elks Lodge, 431 Granby Road in Chicopee, Fridays, noon to 1:30 p.m.
St. Paul’s Episcopal Church, 485 Appleton St., Holyoke, ​Thursdays from noon to 2 p.m.
Grace Lutheran Church, 1552 Westfield St., West Springfield, last Wednesday of the month, 11:30 a.m. to 12:30 p.m.